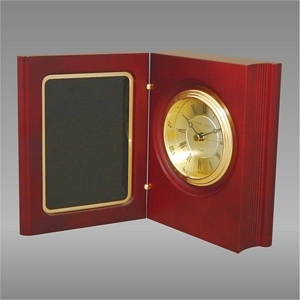 CLK57 ROSEWOOD FINISH BOOK CLOCK WITH QUARTZ MOVEMENT, LIFETIME GUARANTEE AND BLACK BRASS ENGRAVING PLATE. THE BATTERIES ARE INCLUDED. AVAILABLE IN 2 SIZES.